The fewest number of points that No. 8 Washington State had put up all season heading into its matchup with Cal was 28. The Cougars’ No. 1 passing offense averaged more than 40 points per game until it was met by the force that is Cal’s defense. Live on ESPN for Saturday Night Lights, Cal could have done the unthinkable — pulling off back-to-back upset wins over top-15 teams — but the Bears’ offense faltered once again, ultimately costing the Bears a 19-13 loss. “We didn’t play well enough to win, its frustrating, losing is awful and we had chances and we didn’t take advantage of them,” said Cal head coach Justin Wilcox. Cal’s physical defense managed to halt the nation’s leading passer, Gardner Minshew, who, coming into the matchup, had his offense averaging more than 40 points per game. While Minshew was still able to put up 337 passing yards, he was limited in scoring drives. His final one, however, sealed the deal on a touchdown pass to Easop Winston Jr., keeping the Cougars’ College Football Playoff hopes alive. Despite a crucial interception by Brandon McIlwain late in the fourth, a missed field goal by WSU with less than four minutes to play gave Cal the opportunity for a Cinderella story comeback. But there was no fairy-tale ending for the Bears. The Bears’ first drive of the night ended on a sour note, with kicker Greg Thomas missing a 47-yard field goal. Things were not made any easier as Cal did an abhorrent job of moving the ball in the air, with quarterback Chase Garbers totaling just 24 passing yards through the first 30 minutes of play. The Cougars’ defense made sure not to let its quickfire offense have all the glory. While the Cougars soared through the air, Cal nearly did the complete opposite, generating its offensive tempo on the ground. The Bears — who already featured a thin receiving core with Jordan Duncan sidelined because of injury — had to scheme without star wide receiver Kanawai Noa, who was ruled out shortly before kickoff. Though Garbers spread the ball throughout his offense, he put together only 127 passing yards. Cal relied heavily on running back Patrick Laird to move the ball, but he didn’t have much luck, finishing with 18 carries for only 40 yards. Garbers also had many key scrambles of his own on the day, finishing as the team’s leading rusher with 66 yards. “I think we showed everybody, including ourselves, that we are willing to go toe-to-toe with anybody in this country and in this conference,” Garbers said. As the storyline has been all season, Cal relied on its defense to generate big plays. Nearing the end of the first quarter, linebacker Evan Weaver secured an interception off of a pass that was tipped by lineman Tevin Paul, giving his team first and 10 from the Cougars’ 39-yard line. Nearly picking the ball off the play before, Weaver gave his team an opportunity to put up the first touchdown of the night. Garbers’ short pass to Malik McMorris was good for a 2-yard touchdown catch, putting Cal up 7-3 with 11:00 to play in the second quarter. Weaver would go on to lead the Bears alongside fellow inside linebacker Jordan Kunaszyk, who racked up nine tackles and continued to man Cal’s defense. By the end of the first half, WSU only led 13-10, but Minshew had already completed passes to eight different receivers for 202 yards, and Cal’s defensive backs were getting burned along the right sideline. A combination of his lightning-quick release and ample time in the pocket allowed Minshew to systematically execute against the Bears defense. Cal’s defense continued to anchor the Bears as the second half began, holding the Cougars scoreless in the third quarter. That’s when chaos ensued. 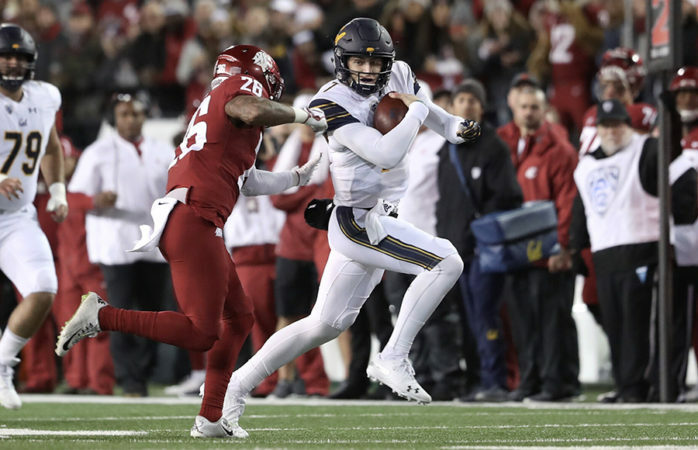 Garbers nearly spelled doom for Cal with an interception by WSU linebacker Willie Taylor — however, Taylor fumbled the ball out of the back of the end zone, resulting in merely a touchback. Garbers and quarterback Brandon McIlwain orchestrated the Bears downfield, highlighted by a 35-yard pass from McIlwain to wide receiver Moe Ways to get into field goal range. To the relief of Cal fans, this time when Thomas lined up to attempt to boot a 46-yarder, his kick was good. Cal 13, WSU 13 — a score that would hold into the fourth quarter. With 11:38 to play, Sheck Wes’ “Mo Bamba” echoed throughout Martin Stadium for the second time of the night. As it did on the first run-through, the song got both sidelines amped up, though Cougar fans seemed on edge, all too aware of the upset alert they were flirting with. Garbers completed a huge 12-yard pass to Nikko Remigio for a first down. What followed was an incomplete pass and a short run by Laird, but the Bears caught a break after a roughing the passer penalty on linebacker Dillon Sherman. The play was Cal’s fifth first down off a Cougar defensive penalty. But as the Bears looked to break away in the red zone, turnover-prone McIlwain tossed his eighth interception of the year. Though Cal would get its chances to score, Garbers could not generate rhythm though the air, throwing several ugly passes in the game’s last few series. The game ended on another sour could-have-been, held down by Cal’s defense — the Bears are now 5-4, 2-4. Christie Aguilar covers football. Contact her at caguilar@dailycal.org. Follow her on Twitter @caguilarsports.